PRINCETON VOTES: This is how it looked at 6:30 a.m. election day in the Community Park School auditorium. Voters said they had never seen lines like this before. 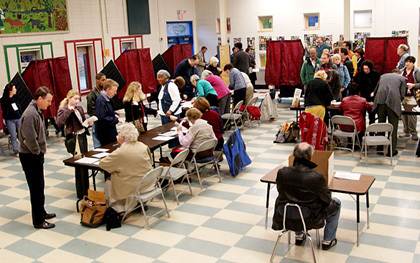 One voter estimated that the average wait at that time was approximately 40 minutes. Democrats have continued their reign in Princeton Borough and Township. The Democratic candidates on the national, state, and municipal levels pulled through victorious with Princeton voters. A string of crimes in the Borough that started last week and continued through the weekend may be connected to a Princeton High School student who has been the subject of threats from a Trenton-based gang.